—Earl L. Linehan, President, Woodbrook Capital, Inc. 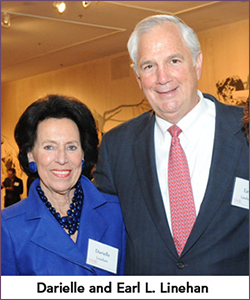 The Linehan Artist Scholars Program was created through the vision and generosity of Earl L. and Darielle D. Linehan. The Linehans’ vision for the Artist Scholars Program emerged from their deeply held belief in the importance of the arts to society. They helped launch the program with a generous gift in September 1997. Their commitment to UMBC and our student community has created a transformative learning experience for hundreds of talented undergraduates majoring in the visual and performing arts who also have a strong record of academic achievement. Longtime residents of greater Baltimore, the Linehans have a distinguished history of involvement with UMBC. Mr. Linehan chaired UMBC’s Board of Visitors from 1993 to 2005, and was chair of the university’s first capital campaign. He served on the Exceptional by Example Campaign Committee, which recently surpassed its goal upon completion in 2011. He is President of Woodbrook Capital, Inc. and serves on numerous corporate, civic, and non-profit boards. In addition to her numerous civic commitments, Darielle Linehan turned her life-long love of books and learning into a vocation, founding the highly acclaimed Ivy Bookshop in North Baltimore. Earl and Darielle Linehan enjoy being engaged with the students and learning about their passion for the arts. We are deeply appreciative of their on-going commitment to the Linehan Artist Scholarship Program and UMBC.